Every state in the South has its own style of barbecue. North Carolina claims it has the best: slow-cooked whole hog, meat shredded and mixed with the crackling before being dressed with a spicy, vinegary sauce – or ‘mop’. 1. Rub the pork all over with the salt and pepper; lay in a roasting tin and cover tightly with foil. If you have time, chill to dry-brine overnight. 2. When you’re ready to cook, preheat the oven to 160˚C, gas mark 2. Roast the pork for 2 hours, then uncover and baste in the juices. Cover again and roast for another 2 hours. Meanwhile, make the vinegar pepper mop; warm all the ingredients together in a pan until the sugar has dissolved; set aside. 3. Uncover the tray. Turn the oven up to its highest heat and cook the pork for 10-15 minutes so that the crackling crisps up. Remove from the oven and leave to rest for 20 minutes. 4. Cut off the crackling and slice into shards; set aside. Lift the meat out of the pan and shred with 2 forks. There should be lots of lovely cooking juices in the pan – spoon off any fat, then return the meat to the pan to soak them up. Pour over the vinegar pepper mop and toss again; check the seasoning. 5. For the slaw, whisk all the dressing ingredients together. Toss with the vegetables and season. You can leave it to sit, chilled, for up to 6 hours. 6. 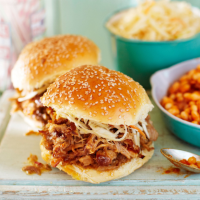 Serve the pork with shards of crackling, topped with slaw, and piled into toasted buns, if liked.